This is so true, sometimes there is such a thin thread holding my mat back, it’s hard work. Thank you for the reminder! So important. So glad you found this meme helpful. Keeping moving forward and saying YES TO YOURSELF FIRST. Happy Holidays. <3 Rose G.
Doormats are experts at beating ourselves up. Many of us are perfectionists and there’s always something we think we coulda/shouda/woulda done better. When I was a child, I once brought home a test with a 100 on it. My dad’s only comment was, “Why didn’t you get the extra 20 bonus points?” We all need to be kinder to ourselves. Treat yourself as you treat others–with kindness, encouragement, understanding, patience. Glad to see I’m not the only who experienced that as a child. And also nice too know that I am not this way entirely due to my own fault/ mistakes… Thank you. YOU are not alone Lynn! and please remember ‘its NOT your fault’! There are thousands of us with the same issues. 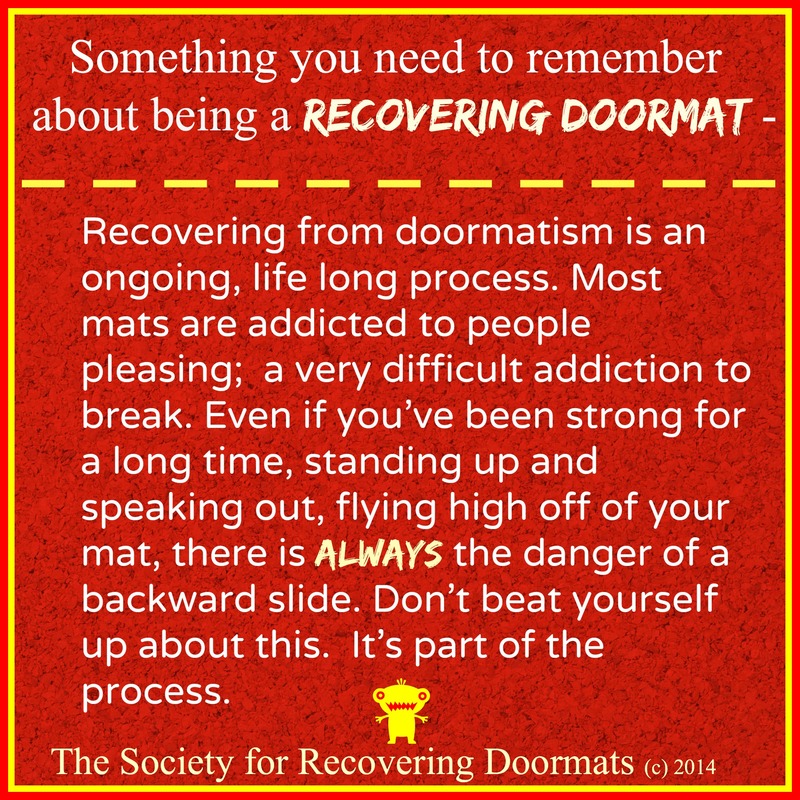 That is one of the reasons I started The Society for Recovering Doormats. If you visit my FB page, (The Society for Recovering Doormats) you will certainly KNOW you are in a lot of great company. 46,000 PLUS all standing up and speaking out. Thanks for being with us. AMEN 100 times Mag! Stop beating yourself up for OTHER’S injustices to you. Your dad asking “why you didn’t get the extra 20 points?” is a clear example of someone having unfair expectations and blaming YOU for not meeting THEIR NEEDS. I am sure your dad meant well, but his behavior was very thoughtless and unkind. As a small child perhaps you interpreted his reaction as ‘I’m not good enough’. Sadly, our parents meant well, but bred a lot of insecurities in us along the way. (Speaking for myself here) The good news is, once you realize that ‘It’s NOT YOUR FAULT’ you can truly move forward. We can’t blame our parents and others and are ultimately 100% responsible for ourselves. Living up to other people’s expectations–parents, spouses, friends–is exhausting and IMPOSSIBLE, so might as well give it up. Sometimes people will be disappointed, but that’s their problem, and a reflection on them and the baggage they carry, not a measure of your worth. Hi TJ, I have no idea what you are talking about. Please explain.